The U.S. Air Force Academy is in the final stages of planning a worship area for followers of Earth-centered religions, including Wicca and Druidism, near its landmark chapel. The organizer of the stone circle says there has been no significant resistance at the academy. Father Jonathan Morris calls the decision, "politically correct cowardice by bumbling bureaucrats," adding, "behind the smoke and mirrors of the supposed high demand for 'Earth worship prayer circles' is a small group of activist atheists in America who seek first to water-down and then to abolish the name and face of God from the public square." The academy Cadet Wing Chaplain, Lt. Col. William Ziegler says: "Every service member is charged with defending freedom for all Americans — and that includes freedom to practice our religion of choice." The core points of druidic religious beliefs reported in Roman sources is their belief in metempsychosis, and their practice of human sacrifice. However, reports of atrocities used to justify imperial conquest are to be considered critically throughout history. Their reported reverence for various aspects of the natural world, such as the ritual of oak and mistletoe described by Pliny the Elder, has also been associated with animism. Modern attempts at reconstructing, reinventing or reimagining the practices of the druids in the wake of Celtic revivalism are known as Neo-druidism. Wicca is a Neopagan religion and a form of modern witchcraft. It is often referred to as Witchcraft or the Craft by its adherents, who are known as Wiccans or Witches. 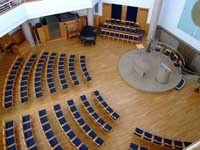 The academy also has worship areas for Protestants, Catholics, Jews, Muslims and Buddhists.